JACKSONVILLE, Fla. - Today was HOT! We topped out in the low to mid 90s with heat index temperatures well into the triple digits. This evening will be mostly dry and warm. Expect beautiful, clearing skies overnight with temperaturtes turning mild. Overnight lows will get down into the mid 70s. 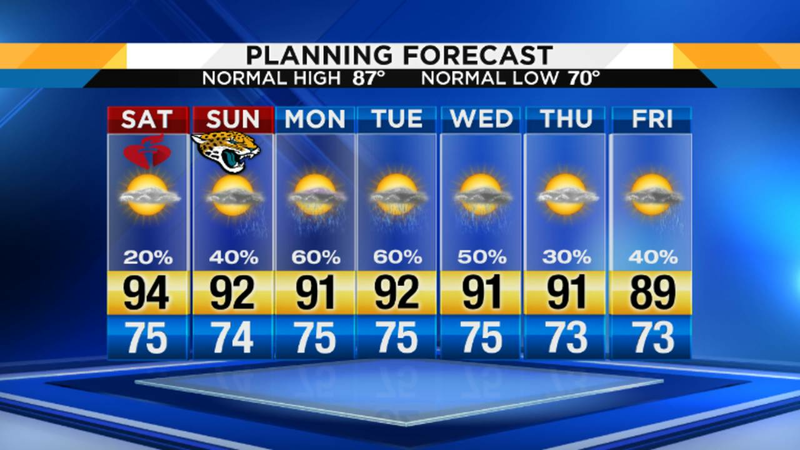 Saturday the hot and mostly dry weather continues. There is only a 20% chance for an isolated shower. Afternoon highs will climb into the mid 90s under partly cloudy skies. Winds will be out of the West between 7-12mph. Sunday moisture returns back into our forecast, but it definitely will not be a washout by any means. The day starts out partly cloudy and warms into the low 90s. You'll notice an increase in clouds during the afternoon hours and chances for rain build up to 40% after 2p.m. Monday and Tuesday will end up being the wettest days this week. Expect 60% chances for scattered showers and storms, especially during the afternoon hours. Highs will top out around 90°. Beach and Boating: High risk of Rip Currents today as the swell continues.